The Saturne XXL 12 foot trampoline is a great and convenient entertaining outdoor kit for your friends and family. 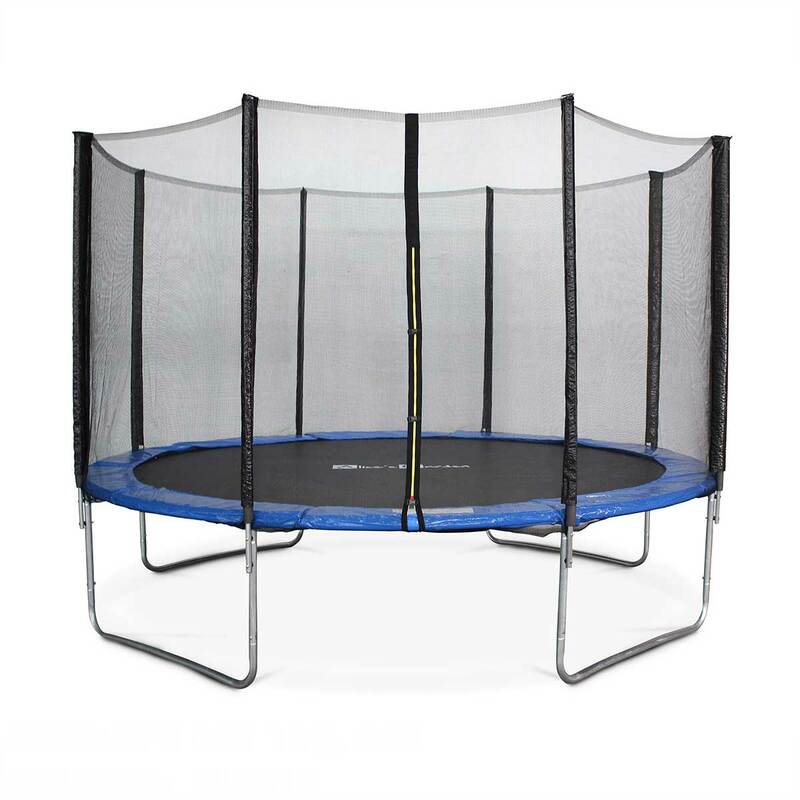 Its sturdy frames combined with a proven safety enclosure system and an excellent bounce dynamic makes it the perfect product to offer plenty of fun in a safe environment. PLEASE NOTE: The item comes without the kit which is composed by a ladder, a protective cover, a shoe net and the anchor kit. You can buy the 12 foot trampoline with the kit here. Alice’s Garden sold more than 200,000 trampolines over the last 5 years in Europe on the back of a strong focus on safety and quality, a deep know-how and a solid customer oriented approach! All of our trampolines have been thought, designed and controlled by experts. The safety of young and old is of utmost importance to Alice’s Garden. The Saturne XXL trampoline is compliant with the latest safety directives in Europe (Norms EN71-14 and 2009/48/CE, CE/ITS France). At Alice’s Garden, we ensure that our trampolines include adequate safety features, including padding, safety nets and warning labels alerting our consumers to the potential dangers that trampolines can pose to children and adults if not used properly. The protective cushion minimises the risk of scratches in the event of a fall. The safety net ensures safe use and prevents falls off the trampoline. This clever 6×6 millimetre net is closable with clips and a zip. The zip is yellow, so that the exit is easily found in the event of an emergency. The trampoline’s W-shaped feet allow it to be fixed to the ground and offer stability. The Saturne XXL trampoline offers excellent suppleness and bounce dynamic thanks to its polypropylene (Permatron) jump mat manufactured in the United States. The US’s know-how for this kind of material has been long recognised. The number of conical springs is not a coincidence either. It has been designed so that the mat is supple and bouncy. The 72 Alice’s Garden springs have been hot-dip galvanised, which proves their quality. Their length is ideal: 14.7cm. With their hot-dip galvanised steel frame, Alice’s Garden’s trampolines are robust and have demonstrated a good weather resistance over the last seasons. The T sections frames are in square shape and their assembly with the frames enables good stability and safety for the trampoline. The Alice’s Garden Saturne XXL assembly is simple and the trampoline can be moved easily to mow the lawn.